Great shadow for the 4th of July! Cute shadow of your Independence Day Kim. That is also celebrated as Fil-American Friendship Day! Check it out and hopefully ill see you on Weekday Photos, have a great sunday! Lovely play of shadows behind those cute little ones! Delightful shot! Sunny SSS greetings from Casablanca, Morocco! Such a sweet Shadow Shot of flag waving little girls! Happy SSS & also July4th to you!! Aren't they the perfect poster kids for future fredoms!!! How festive! Love those colorful ribbons! Great shadow shots. Cute kids. Thank you for the visit and leaving nice comment. Have a great week. 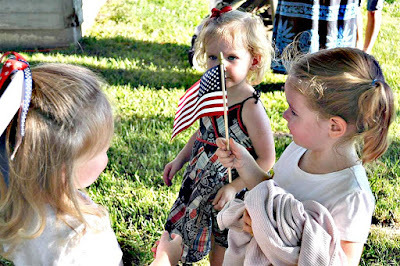 What great photos - children enjoy the Fourth so much, don't they? 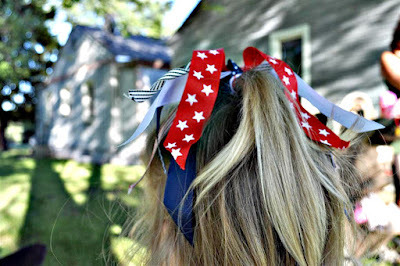 Love both the pictures - wish I could still get away with cute bows in my hair like the last shot though!! Wow-you even go the comment fonts to show up in red! Too clever!